In any conversation about bees, inevitably the honeybee takes center stage. Why is that? Are honeybees really more important than other bees? 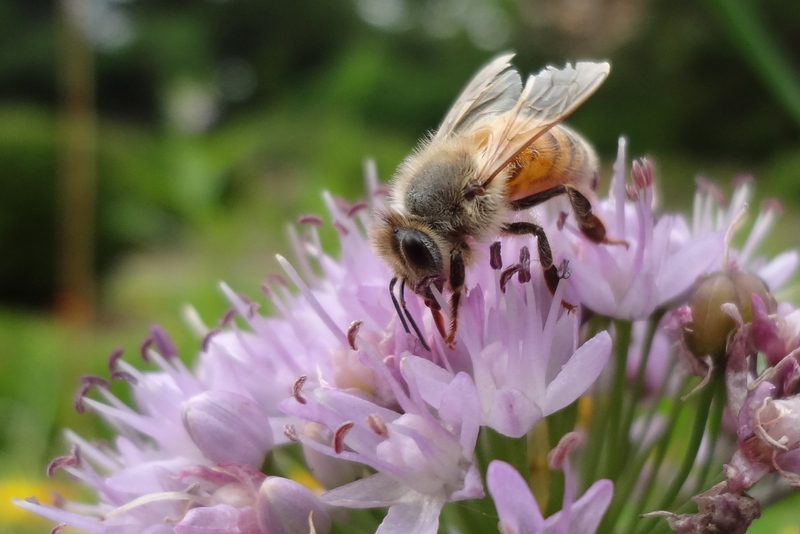 Would our entire food supply be threatened if honeybees were to vanish? Our native bees, sometimes described as pollen bees, are not only more efficient pollinators but have also developed techniques for pollinating flowers that honeybees are incapable of pollinating. Honeybees may be the proverbial canaries in the coalmine in certain ways; whatever fate befalls them may also befall our pollen bees, as all bees are likely vulnerable to chemical poisons, viruses, and environmental stressors. It makes sense that protecting one kind of bee will benefit other kinds of bees. However, the greatest overall benefit will occur from giving our native pollen bees more priority. Consider our native pollen bees for a moment. They range in size from the very small sweat bees to the very large carpenter bees, and over time, they have coevolved with our native plants in a colorful and interdependent parade of diversity. It stands to reason the native bees have the “know how” and design necessary to be efficient pollinators of those plants. For example, many native flowers hold their pollen tightly and it literally must be shaken out in a process called “buzz pollination”, a skill perfected by bumblebees. Tomatoes, of the nightshade family, fall into this category. Therefore, every ripe red tomatoes eaten is the product of bumblebee ingenuity! The beautiful orchard bee’s emergence coincides with the early spring bloom of members of the rose family, such as apple blossoms, and 250 of these industrious bees can do the equivalent work of two hives of honeybees in an apple orchard. In a squash flower, you will find the squash bee! These honeybee-sized specialists only pollinate flowers in the squash family; literally sleeping in the flowers, they begin pollinating long before other bees are awake and active. With such an eclectic and diverse group of pollen bees, wonder how the status of the non-native honeybee has been so elevated? The answer is simple: because of the monetary value honeybees provide in the form of commodities and services. Due to their perennial nature (unlike native bees, they overwinter in their hives), they produce a surplus of honey and their hive’s wax makes superior candles– both valuable commodities. Additionally, their hives are easily transported around the country to exploit their pollination services on monoculture (one-crop) farms. We have been told that our food system would collapse upon their demise. This is in fact true, based on today’s mainstream agricultural practices and techniques. Unsustainable monocultures such as almonds in California, blueberries in Maine and apples in Washington are dependent on honeybee pollination. In effect, the crops bloom for a two-week window at the same time each year, and all the plants bloom at once. This is actually a pollinator’s desert; the rest of the year, there is no pollen, no nectar. On monoculture farms, when the blossom period is over, the honeybees are loaded onto tractor-trailers and transported to new fields where their services are required. For native pollen bees, such a system has insufficient plant diversity to sustain a population. Since they are restricted by their own size to a half-mile to mile radius, they need a longer time of blooms over a small area to provide food throughout the summer. It is achieved by a diversity of plants that bloom from early spring to late fall. Honeybees and their spokesmen have pulled on the public’s heartstrings and their plight has started a swelling rally cry for change: save the honeybee, save our food supply. But I rode the swell to a nearby realm… and discovered a diverse group of native pollen bees that we need to better understand and appreciate. Once we understand these native pollen bees, we can develop plans to utilize them to their full potential by transforming our current agricultural practices to include wind rows, corridors and fallow fields of biodiversity that can sustain our native pollen bees beyond the bloom times of current mainstay crops. At the same time, we need to listen to the rally cry and curb harmful use insecticides and herbicides to protect ALL pollinators. 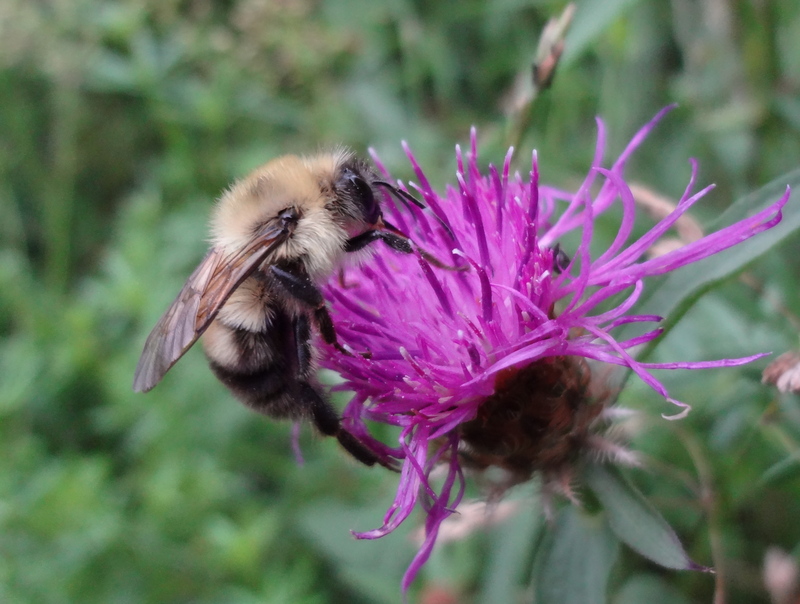 Transforming the landscape to accommodate native pollinators will produce lasting, pleasing results that will not only save the food supply but make the environment healthier. In the meantime, this newfound knowledge of our native pollen bees can be used to initiate change beginning in our own backyards. For more information on specific native pollen bees, look at the bee field guide located on this website.